Residential concreting can be classed as anything around peoples residences, from new and existing homes, to units and body corporates, it might be a driveway or patio for a new home or a court yard area for a unit. It could be a new bin store area or car parking for a body corporate. We do it all. We do shed slabs, big and small. Carparks or lone car spaces. 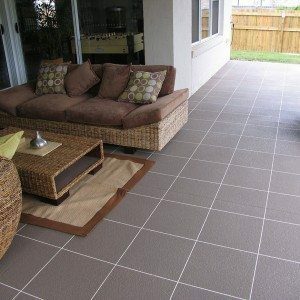 We do concrete patios and pool surrounds to driveways and paths. We offer a wide array of finishes for these areas also from standard plain grey concrete to exposed aggregate concrete, stencil concrete, stamped concrete, or honed & polished concrete. 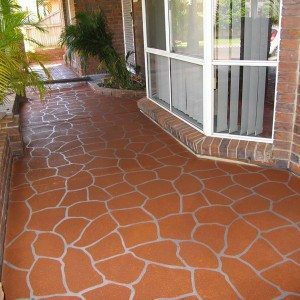 We also rejuvenate and decorate existing concrete surfaces. We can stencil old concrete to look like new, also known by brand names such as Covercrete, Flocrete, Oncrete, Spraypave, Stylepave, Avista Crete. We offer a range of other coatings too, epoxy flooring and flake epoxy flooring, spray on faux granite flooring called Florentine Flooring, coloured sealing. We also clean and seal your old concrete too. Concrete Brisbane offer a range of associated services when doing concrete work, including but not necessarily limited too, drainage work, yard leveling, retaining walls, termite barriers, etc.